Another day ends at sunset for boaters off Northern Vancouver Island, British Columbia and two Orca Whales take advantage of the peacefulness by resting in the sunset lighting. Dark clouds create a beautiful image at sunset as the lighting filters through the clouds and glistens off the surface of the water where two Orca whales are resting off Northern Vancouver Island in British Columbia. 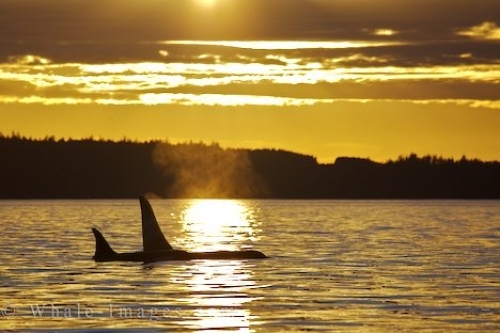 The bright yellow sunset highlights the rippling water as the mist coming from their blowholes lingers above the Orca. A male Orca is easy to recognize as it matures because its dorsal fin reaches heights of about 6 feet while the female's only grows to a maximum of 3 or 4 feet. The fin on the female Orca is generally more curved than the male's which is a tall, elongated triangular shape. This resting mode that Orca are commonly seen doing along with breaching, foraging, traveling, spyhopping and tail slapping, is characterized by a series of regular shallow dives performed together with a family member. They travel at a slow speed of about 1 to 2 knots and is often seen after the Orca have been foraging for some time. This behavior can be short lived or last as long as a couple of hours depending if the entire pod has reunited. Other members of this pod are within a close proximity as a family is known to remain together their entire lives. Once the matriarch calls to the rest of the pod, the resting will stop until they regroup and continue on their journey. Many whale watching trips off Northern Vancouver Island in British Columbia are returning to home base during these sunset hours and the likelihood of capturing one of these pictures is very real. The best months to find Orca whales off Northern Vancouver Island is usually between June and October when the Orca following the salmon runs into the area. Captains of these whale watching vessels off Northern Vancouver Island are extremely knowledgeable of the Orca whales which seem to return every year.